What else is there to say? Joe Mays was completely ineffective again tonight against a punchless Twins offense, and in his six starts thus far, he hasn't even come close to turning in a quality outing. His ERA after tonight's game stands at 10.27, and it actually improved after surrendering six runs (two earned) in 3.1 IP. There is simply no excuse for his continued presence in the rotation. RC doesn't even care who takes his place at this point, be it Mike Wood, Jimmy Gobble, or Denny Bautista -- who reportedly looked good today in a simulated game. Any one of those guys would at least give the Royals an occasional chance to win, and we simply can't say the same of Mays. Bautista won't be available the next time Mays' spot in the rotation rolls around, so unfortunately, the chance remains that Mays will stay on at least until Bautista is ready to rejoin the club -- and it's somewhat telling that he threw his simulated game today, which puts Bautista on that throwing schedule. But if that's the case, there still doesn't appear to be any logical reason why Wood (or Gobble) and Mays can't flip roles in the meantime. We simply can't stand the prospect of another Mays start. It was a decent risk and a nice thought, but the Joe Mays reclamation project must end! 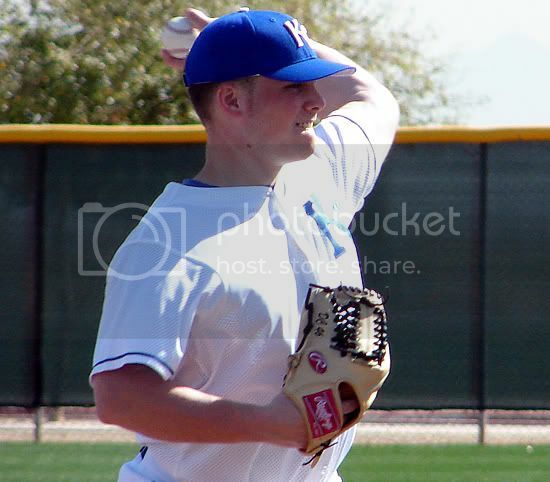 A few pitchers in the Royals minor league system are really standing out this season. Billy Buckner leads the way, and after his win on Tuesday, he owns a perfect 4-0 record and a 2.94 ERA in the hitter-friendly California League. Buckner is repeating High Desert to begin the year, and thus far he's been able to successfully keep the ball down while using his tremendous curveball as his out pitch. His GB:FB ratio is stellar, and he's yet to allow a single home run while striking out 30 in over 33 innings pitched. RC Correspondent Jon Rosen reported on Buckner a couple of weeks ago, and since that time he's continued to impress us. It might not be long before Buckner moves up to Wichita, and he's beginning to make a strong case as the best pitching prospect in the organization. Buckner's teammate, Danny Christensen, is only 17 days older, and he's been every bit as good. In some respects, Christensen's been even better, as his stellar control has led him to a team-best 1.07 WHIP, which ranks third among all starters in the California League. In addition, Christensen has used his 12-to-6 curve to strike out 33 batters (against just five walks) in 29 innings pitched, and his ERA of 4.03 is very respectable for a High Desert pitcher. Christensen did very well last season for Burlington after missing nearly all of 2004 with Tommy John surgery. His progress this year has been remarkable, and he's also making a strong case to become a very legitimate pitching prospect. Burlington's Matt Kniginyzky is another pitcher who looks to climb in our rankings. 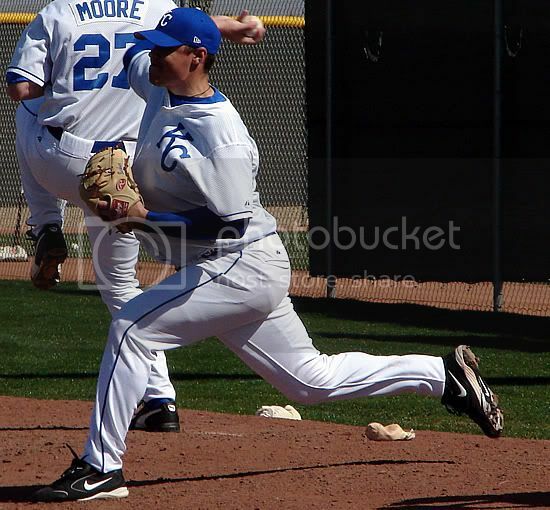 Kniginyzky was drafted in the 23rd round in last year's draft, and he entered the system as a reliever. His first exposure to professional baseball was nothing to get too excited about, as he put up a 4.66 ERA while pitching out of the Idaho Falls pen. In 29 innings, he surrendered 35 hits (.287 BAA) and 13 walks, but he did strike out 40 batters. The Royals liked his stuff enough to convert him into a starter this season, and thus far, the results have been excellent. Kniginyzky features a low-90s fastball and a hard curve, and he's used those to carve out a 2-1 record with a 3.16 ERA in a Midwest League-leading 37 innings pitched. He's struck out 30 batters while surrendering 32 hits and eight walks (1.08 WHIP), which are very good numbers for a player making his full season debut just 10 months after being drafted. Kniginyzky is already 23-years-old, so the Royals are moving him quickly, but right now he's the anchor of Burlington's staff. Anyway, that's it for today. In the coming days, we'll point out our take on a few of the organization's position player prospects, such as Chris Lubanski, Chris McConnell, and Matt Tupman. I thought this was a great article in today's KC Star. Another Royal goes down, another is called up from Class AAA Omaha. And once again, Aaron Guiel is passed over, this time for Justin Huber. The prevailing mood out there among Guiel loyalists is that the continued snubbing of Guiel by Royals general manager Allard Baird has become personal, pure and simple. “For anyone to think it’s personal,” Baird said by phone, “I find that personally insulting. Baird said the call-up of Huber was based on the club’s needs. Guiel has brought his average up at Omaha to .247 and is on another impressive home-run pace with seven already. He hit 30 last year at Omaha. Baird signed Guiel from Oaxaca of the Mexican League in June 2000. But after Guiel’s impressive 2003 season in which he hit .277 with 30 doubles, 15 homers and 52 RBIs in just 99 games, Guiel seems to have been tossed aside, yet not always for prospects who fit into the team’s future plan. Emil Brown, for example, is just two years younger than Guiel but apparently cannot play his way off the team, no matter how poorly he hits or — especially — fields. But, once again, Baird said the Royals don’t have it in for Guiel. In defense of Mays, (even though he hardly deserves it) he only gave up 2 ER last night thanks to Angel "Neifi" Berroa's error. Wow....Baird has gotta go. Joe Mays being on this team in the first place is bad...but him still being here now is an absolute joke. This is only one of a LARGE number of atrocious decisions by Baird/Bell just this season alone. Why is Angel Berroa our starting shortstop?? Besides making the occasional spectacular play, he is CLEARLY not an MLB quality hitter and makes a whole lot of dumb mistakes in the field and on the basepaths. Also, how is Emil Brown on this team, and NOT Aaron Guiel. I understand putting Costa ahead of Guiel in the beginning, but what does Guiel have to do??? His numbers at the MLB level are good..he's got good power and is a WAY better outfielder than Brown. At the VERY least, when Costa gets back, he should be platooning out there with Gueil. Brown needs to be outright released. He is atrocious. Also, Stemle and Hudson over Andrade and Perala in the beginning??? WTF!?!?!? This is just inexcusably horrible. I understand mistakes being made in baseball personell decisions, as you can't project the future 100%, but wow.....these are plain to EVERYONE seemingly except for Baird and Bell. Also, what does Esteban German have to do to get some starts...ON THE INFIELD!?!? He's hitting over .500 and his OBP is over .600!! What, Bell doesn't feel our lineup needs speed or the ability to draw a walk or put the ball in play consistently?!?! WOW!! We have the players to be a decent team throughout our organization to be a decent team this year and improving over the years.....but our GM/Manager are doing THE single worst job I've ever witnessed in baseball history. Another thing, why hasn't Gobble been a starter the past few years. His ERA numbers aren't "great," but he was a pretty decent solid pitcher for us in 2003 and 2004, with a winning record I do believe, and he seemed to be on the exact same path as many of the Tigers starters...who were allowed to figure things out over a couple seasons. Gobble was good at times and bad at times, but overall he was dependable and has CLEARLY gotten stronger stuff/a stronger arm this year...he has GOT to be given a chance in our rotation. This is an absolute joke. I understand that hindsight is 20/20 and that you can't always look at things that way, but man, these moves have been obvious since Spring Training........what is it going to take to get a new GM and manager....as soon as that happens we are going to get drastically better in a heartbeat. I think it's time for Allard to adopt the George Costanza philosophy - whatever I think I should do, I'll do the opposite. He might become GM of the year!! Thanks for the correction. I'm not sure how I misread the box score to be six earned runs, but I've corrected it. Does anybody know how to pronounce Kniginyzky? That, or find a way to get Bonds and Griffey in the same outfield, and not really give up that much! Oh, and hooray (!) for a win. By the Royals. On the road. In a shutout. By one run. But only against Minnesota could Jeremy Affeldt walk six batters in five innings and not allow a single run. Seriously Jer, after I praised you for pounding the strike zone against Oakland, you dish out SIX free passes to the only team with less plate discipline than the Royals? C'mon, brother, show us some love! real quick, a player who was hitting .200 at the time of the robinson call up . second, mays gave up a boatload of runs on his own. i've always believed that how you respond to adversity is important as well. it was an error to start the inning (as i recall), and mays easily could have pitched around it. instead, in typical joe mays fashion, he gave up both on the inning and on his teammates. it was a pathetic outing and blaming berroa for his error only makes it worse. berroa made an error. he didn't make three more. mays gave up a hard hit ball to berroa that he booted. he proceeded to give up a boatload more hard hit balls and numerous walks. pathetic. 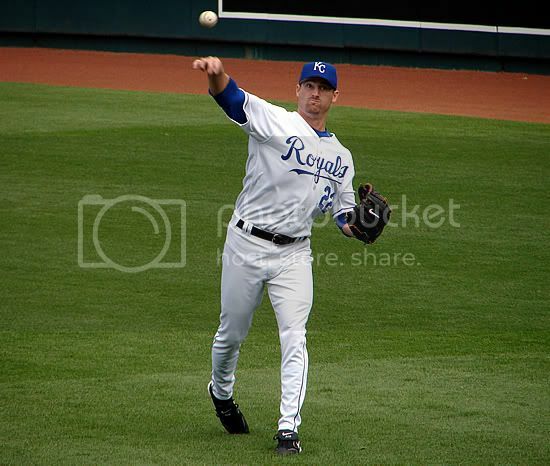 The Royals definitely need to switch to flannel uniforms. No, it's cotton -- it breathes. kniginyzky is pronounced "nuh jin skee"